That’s why we’ve decided to start Cosplay Convo – Exclusive interviews with models from our team of cosplayers, talking about their experiences in cosplay, their future plans and why they continue to work with CSC. This week, we sat down with Yuffie Bunny, who recently modeled our Vixen of Versailles Costume for a shoot with Anatomy FX. Yuffie Bunny: Shoujocon 2002! It was an extremely eventful first convention. I didn’t cosplay at it; because I had no idea what cosplay was at that time. But I made some friends, who were cosplaying, and we connected over our love of anime and manga, and I thought it was so awesome how they had made their own costumes for the convention. I wanted to be able to dress up with them at the next convention, so we could have even more fun together, and it just kind of snowballed from there, haha! YB: Rikku from Final Fantasy X was my first real attempt at cosplay. I had just gotten finished with playing the game, and I really liked her character, plus her outfit didn’t seem too hard to do. I didn’t know how to sew at the time though so had some help on it and bought some pieces from the store. But I was determined to cosplay her, no matter what! She is just so much fun, and I love the multiple layers to her personality and who she is. I ended up cosplaying multiple outfits of hers from the sequel game, FFX-2, and I’m in the middle of actually remaking FFX Rikku from scratch! YB: I talk about this in the video blog (link coming soon!) review I did for the shoot. At first I was skeptical, because yes, a lot of cosplayers make their own costumes. But then I thought about it for a moment and realized that every now and then you have to remind yourself to not be so serious and just have some fun. That’s exactly what I saw in this opportunity, a chance to just have fun with a costume and maybe show some new, and old, cosplayers that you don’t always have to hand make everything you cosplay. As long as you’re having fun and you give proper credit to who helped you or who made certain pieces for you, it’s just fine. CSC: For CSC, you decided to wear our Vixen of Versailles costume. What made you pick that particular costume, and what was the feedback from your fans like? Did they enjoy it? YB: I decided to go with Vixen of Versailles because a few weeks before being contacted by CSC I had teamed up with my friend Tony from Anatomy FX to help bring one of his long time visions to life. 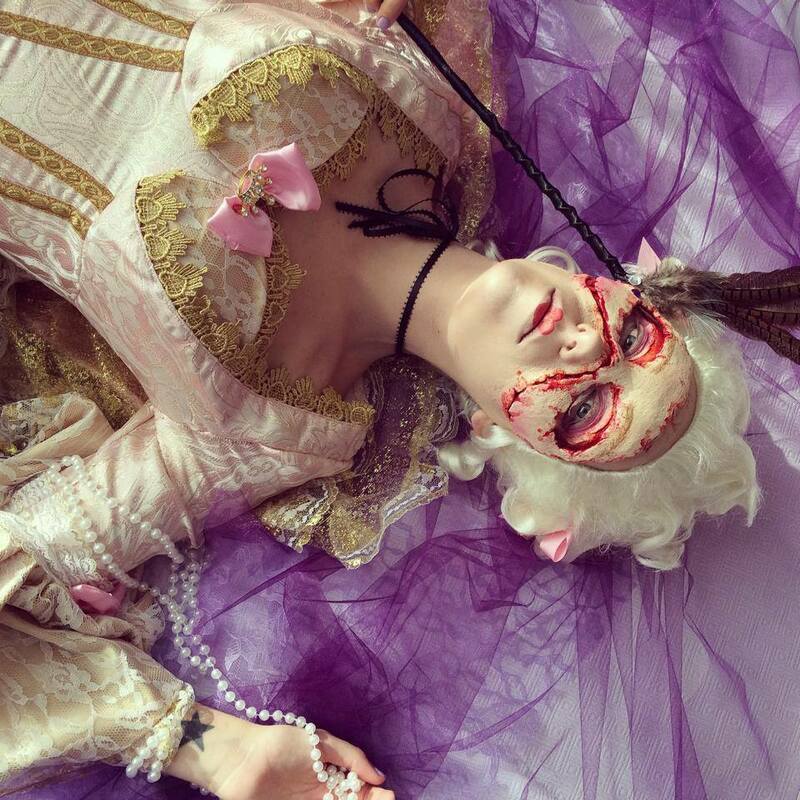 It was perfect timing because we wanted a Marie Antoinette look for the shoot. 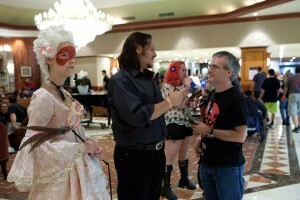 I had poured over the site though, and saw tons of costumes I would have loved to shoot, from all kinds of genres. But upon seeing the Vixen of Versailles costume I was like, “DONE! Tony, we CAN do this!” It was perfect, and really truly brought the whole look we did to life. Everyone at Monster Mania was totally wowed by not only the intense makeup job Tony did but the costume as well. I was stopped a lot for photos, and people wanting to know where I got my costume. The typical reaction was sort of; “I’m terrified, but I also think I’m love!” Haha! YB: I try to keep as active across popular social media as I can. I practice my hashtag game a lot, haha! And of course, I try to actually talk back to anyone who engages with me online. I certainly love meeting them at conventions more though! It’s nice to meet people who really like what you do, and have taken the time to follow you, comment, repost and buy prints or something from you. It means a lot to me, honestly. It shows me that someone out there appreciates all the hard work I do. YB: Oh boy! I have so many cosplay plans coming up! I have 5 new cosplays that I’m currently finishing up and working on, to debut over New York Comic Con and Katsucon. Another, Death from Grimm Fairy Tales, I’m fixing up to shoot very soon. And another, Kiani from Fathom, I’ve just finished so I’m shooting it for Aspen Comics and Webble’s cosplay trading cards. So there’s A LOT on the horizon to look forward to. Some of these have been a long time coming too (like my remake of FFX Rikku), so I’m very excited for them as well. YB: Total A-Plus! CSC was super friendly, and very accommodating in helping Tony and me see our vision come to life! Shipping was super quick, and packaging was spot on. Eeverything was well made and held up just perfect for our shoot and then walking around a convention. In the end, I was so satisfied with the experience that I’m ready to go for round two, hopefully!